One of the things you do as an analyst is talk to companies. A lot of companies, potentially, depending on what you cover. In between talking to companies, you’re also doing research on them. What do the trajectories of their products look like relative to one another, as measured by a variety of proxy metrics? What story are their financials telling us? And so on. When you do this for years, the hundreds of conversations and the hours of research, unsurprisingly, begin to reveal patterns. The primary job of analysts, in fact, is to notice such things. One such pattern I noticed five years ago or so was that companies were having a harder time making money from software. Not a hard time, precisely – Microsoft and others were effectively still printing money through the up-front sale of bits – but harder. Traditional software companies were facing stiff competition from SaaS-players and open source. Commercial open source organizations, for their part, were cycling through models from dual licensing to open core in an effort to try and find a reliable mechanism that would convince customers to pay for something they otherwise could obtain for free. The companies making some of the most interesting and technically sophisticated software, meanwhile, not to mention generating the most revenue and achieving the highest market caps, were not in the business of selling software. Many even made their innovative internal software assets available as open source, implying that they saw more commercial benefit to simply making the code available for free than they would have trying to monetize it. The evidence suggested, then, that software’s intrinsic commercial value – at least in the traditional, perpetual license sense – was declining. This was the message I discussed with the audience in May of 2011 at the Open Source Business Conference. The odd thing was that even as software was becoming more difficult to sell, it was simultaneously becoming more strategically important. Less than three months after I spoke to the OSBC audience about the observable transition in market valuations of software companies, Marc Andreessen’s op-ed “Why Software is Eating the World” made its appearance in the Wall Street Journal. Its reception was such that the title has since become a cliché. In the piece, Andreessen succinctly articulated a position that many now take for granted: that software was transforming entire industries, and that non-technology companies were either becoming or being replaced by technology companies at an accelerating rate. This seeming paradox has occupied a lot of my time over the past five years. Looking at the financials of software companies, SaaS companies and technology companies that don’t sell technology. Talking to companies with very different perspectives on software, from commercial open source to proprietary software to IaaS. 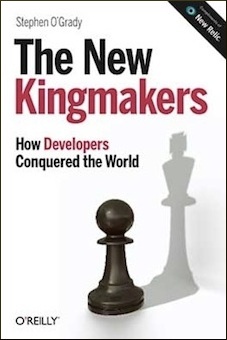 And of course speaking with and reading the writings of a lot of developers along the way, to get a sense for where they see things headed, and what they value. It’s all been an attempt to answer a simple question: how is it that software’s strategic importance could be on an opposite trajectory from its commercial value? How could software be more important but worth less? One output from this work has been “The Software Paradox,” an O’Reilly title that launched last week and which a few of you have been kind enough to notice. It’s available as a free download from O’Reilly, courtesy Paypal, right now. If you prefer to get it via your Kindle, it should be available there in a few weeks. If you have other questions or want to see the Table of Contents, those are at thesoftwareparadox.com. 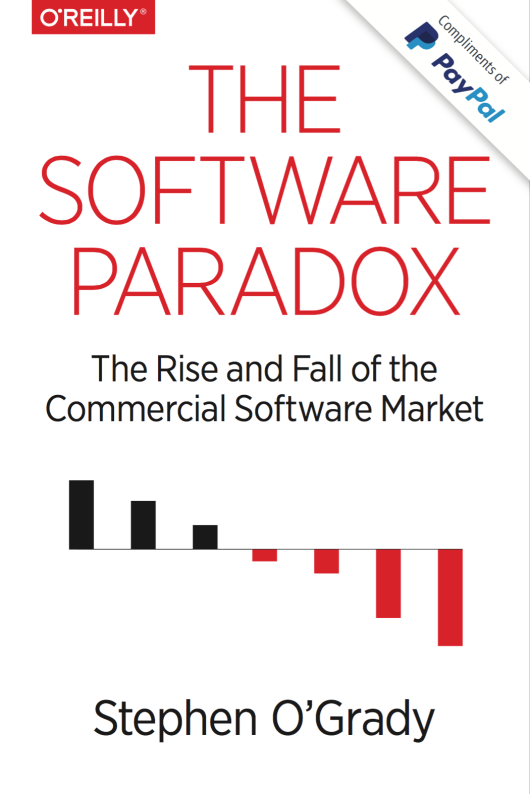 Either way, my hope is that for anyone in the software business, or those competing with it, the book will help challenge your understanding of the software industry and the economics behind it – particularly on a going forward basis. Even if you disagree with the premise or your business is currently an exception to it – and there are many, to be sure – it’s worth considering the idea, because many that assumed they were exceptions were caught scrambling. Lest I forget, I need to thank Kate for putting up with the time it took for me to put this together, and for those of you I will not out here who took the time to not only read the book but provide feedback ahead of time – your feedback was invaluable. Thanks, also, for those of you who have taken the time to read it already or will in future. Whatever your take on the argument, there is nothing more valuable than your time so I appreciate you spending it on this.